Weezer have teamed up with Kermit the Frog, Miss Piggy, Gonzo the Great, Pepe the King Prawn and the rest of the Muppets in their video for "Keep Fishin'," the band's second single from Maladroit. In the clip, Weezer are guests on "The Muppet Show," and, Muppets being Muppets, hilarity ensues. The "Keep Fishin' " video features a Muppet chorus singing backup, running commentary from Statler and Waldorf, a trip to Beaker and Bunsen's lab, and some "quality time" spent backstage with Miss Piggy, according to a spokesperson for the Jim Henson Company. "Keep Fishin' " was directed by veteran Weezer auteur Marcos Siega, the man behind the "Dope Nose," "Hash Pipe" and "Island in the Sun (Version 1)" videos. Weezer, Siega and the Henson Company staff shot the clip June 18-19 at a Manhattan Beach, California, soundstage. For Weezer, working with Henson Studios was a chance to live out a childhood fantasy. "Being a guest on 'The Muppet Show' was a childhood dream we all shared, so we were ecstatic when the Muppets agreed to be in our video for 'Keep Fishin',' " Weezer said in an official statement. "The Muppets can really rock!" The Muppets themselves praised the band. "Weezer fit right in," Kermit the Frog said in a statement. "They're rock stars, they're used to being around animals, bears and egotistical pigs." 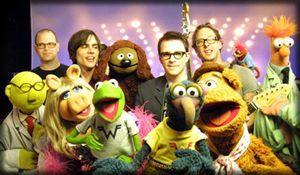 Weezer now join the ranks of such musicians as Elton John, Alice Cooper, Debbie Harry and John Denver, who've all been guests on "The Muppet Show."